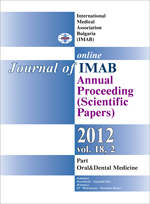 TRANSMISSION OF Porphyromonas gingivalis FROM CAREGIVERS TO CHILDREN. Periodontal diseases are socially significant diseases, which occur in adults but in children and adolescents as well. Despite a low prevalence of aggressive periodontitis at a young age, its severity is a challenge for pediatric dentistry. The goal of this study is to find if the prevalence of Porphyromonas gingivalis among children whose parents suffer from periodontal diseases is greater than among children with healthy parents. - Polymerase chain reaction (PCR). When PCR was used P.gingivalis was found in 35.5% of parents with periodontitis and in 6,5% of their children, children with healthy parents and their parents. No statistically significant relation (P>0.05) between periodontal parents and their children was found. Studying such correlations and standardizing methods of detection could contribute the evaluation of periodontal disease risk in adolescents. Key words: P.gingivalis, transmission, periodontitis, plaque. 18. Tanner A, Maiden MF, Macuch PJ, Murray LL, Kent RL Jr. Microbiota of health, gingivitis, and initial periodontitis. J Clin Periodontol. 1998 Feb;25(2):85–98. [PubMed] [CrossRef].